The status of your Applied Smart Ration card application can be checked online by visiting the website of Tamilnadu Public Distribution System (TNDPS) official website portal. Click here to get to TNPDS official website. 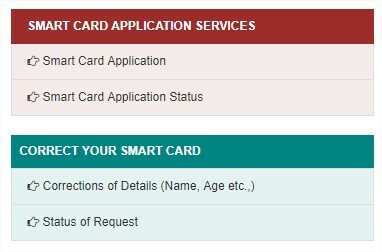 In the right-hand side, you can see a Section named “Smart card services“. Click on the “Smart Card Application status” under that section and you will enter a page with a textbox column asking you to enter the reference number in it. You will be issued a reference number when you submit your smart ration card application. Enter the Reference number in the Textbox column and then click on the “Submit“. Once you hit the “Submit” button you will be shown the status of your smart card application. If you are not given any reference number during the submission of your application follow the below steps. TNPDS has provided applicants with Help-lines and help-desks which will be answering to your every query and doubt. Call the number 1967-425-5901 or 1800-425-5901 Toll-free number which will reach the Help-desk of that state’s Public Distribution System. Then explain your problem to them and know all the details of your ration card which is also included with knowing the status of your smart card application. These are the steps to know the status of your Applied Smart Ration Card. 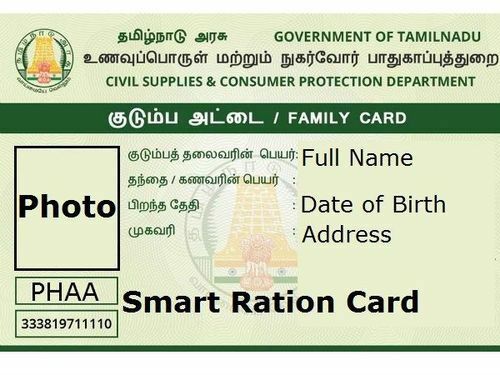 The government of Tamilnadu is issuing new Smart Ration Cards in place of old Ration cards. The existing ration card holders will receive the smart card with a notification to them via SMS to their registered mobile number. For new applicants of Smart Ration card, follow the steps explained below to apply for the Smart Ration Card. Go to the official website of the Tamilnadu Public Distribution System (TNPDS) at www.tnpds.gov.in. On the homepage, you will have “Smart Card Services” section on your right-hand side. Click on the “Smart Card Application” under that section. On clicking that you redirected to a page showing all the detail columns that need to be filled by the applicant. You have to fill in the following details to complete the application form. Name of the Family head, Address of residence with District, Village, and Pincode are t be filled with proper details. It is followed by the Email address ( which is not mandatory) and Mobile numbers in the first section. In the second section, Card Option including No commodity card, Rice card, Suger card and others which are needed to be filled by the applicant according to their eligibility and other parameters. Relevant and legal documents should be uploaded in the form itself supporting your residence or identity proof mentioned in the details. After going through this procedure, hit “Submit” to submit the Smart Ration Card application on the Public Distribution System website itself. After the submission, you will be given a Reference number regarding your application which will be further used to track the Status of your application. If you are not provided with any internet infrastructure it will be best for you to follow the Offline Application method. The following steps will explain how to apply for the Smart Ration card offline. Go to your nearest Ration card office or e-seva office and collect the Smart ration card application forms. Fill in all the details as explained above and attach passport sized photographs to the application form. Then attach required legal documents as a Proofs which will be further validated by the officials to approve you as that State’s citizen. Submit the application to the office itself. In return, you will be given a tracking or Acknowledgment number. That number will be helpful in tracking your application card status. After 15-20 days of application submission, you will be delivered a new Smart Ration Card to your residence address, which is mentioned in your application. How to apply for a Digital Ration card. How to apply for a new Ration card in Tamil Nadu. How to Check the status of Smart Ration card.